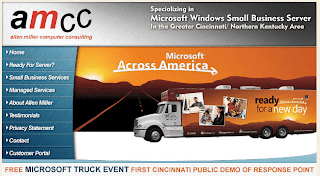 We (AMCC) are going to be doing the FIRST PUBLIC Response Point demonstration in Cincinnati on Tuesday, July 15 from 8 am to 12 noon at 4555 Lake Forest Drive in Blue Ash with the Microsoft Across America Truck. If you are in the area please consider attending and feel free to pass this invitation along to your friends. You can register at http://www.clicktoattend.com/ Event Code 129354. A representative from NGT, a SIP Trunking provider that is partnering with Microsoft on the Response Point product, will also be on site and available to answer your VOIP service questions. NGT has generously donated a $400 Edgemarc device which will be offered as a promotion for some lucky new customer.